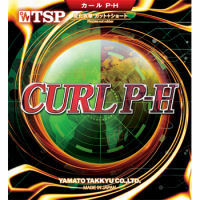 Curl P-H long-pimple rubber was produced with the longest and widest pips that the rules allow. Curl P-H has the ability to produce a unique knuckle ball effect on shots, as well as effective speed for offensive shots. Curl P-H allows short backspin push shots over the table, that are not possible with other long-pimple rubbers. Staff note: Unlike most long pimple rubbers, this rubber can produce quite a lot of backspin on pushes. The pips are stiff and grippy, and in some ways the rubber almost acts like a hardbat rubber, allowing some heavy backspin but also good speed on offensive shots. Used by 2-time European Champion Ni Xia Liang.